1. What is your fitness regime like? My main focus is running. I'm always wearing a running hat so all my exercises will cater to what is required for running. In a week I run 3 consecutive days and the remaining two days are for strength training to strengthen my core, upper body and legs. But! If I'm training for any particular event like a 10 k or half marathon again my training differs. I'm an early morning person. My days begins at 4.30 am and head for running subsequently. If I am not running then I’m invariably in the gym for my strength training. 2. What inspired you to take up running? I’ve always been into fitness and more of a cardio person. I used to run a lot on the treadmill but had never thought of marathon seriously. 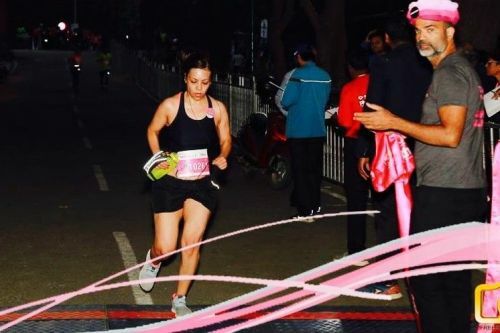 A group of people from my apartment were doing marathons and I thought if I love running so much I should try and I did my first 10 k Pinkathon which gave me immense joy and peace. From then no there was no looking back. 3. What are the benefits of running? Running is very important both for physical and mental health. It releases happy hormone endorphins which makes one happy! Overall it’s a very good physical activity which challenges your endurance level. 4. What does it take to complete a full marathon? For running a full marathon it is not just completing 42.2 km. it's about finishing it strong. It needs a lot of dedication and training to complete it! Training for a marathon also teaches you life skills like determination, persistence and being resilient. It's that immense joy, peace and content you get when you cross the finish line and that feeling is unexplainable. It's all about doing small things consistently and not just doing occasional big things!! Since I was 18-years old I have always been physically active. I was very regular with my exercise, but was never into serious running!! It's only since the last 4 years I have been into running very seriously for which I'm very happy to have adapted. Running gives me immense joy and peace! For me running is very divine, it heals me internally. It's like meditation for me. Through this journey, I have learned many things like managing time. It has brought in discipline and dedication. I started off running 10 k and with consistent training and good understanding about running I increased my distance to 21 k and my dream was to do full marathon which I fulfilled in October 2018 Bengaluru marathon. It's been quite a journey and I have truly enjoyed every bit of it!! It has transformed me to a better and a happier person.